Description: 114mm Gutter. 4m Mahogany Woodgrain Effect Finish Manufacturer: Floplast Colour: Mahogany Woodgrain Effect Finish Woodgrain Rainwater Sytems come with a 10year manufacturers Performance and Colour Guarantee. Authentic Mahogany Look. Ideally suited fo.. Description: 90 Degree Mahogany Square Gutter Angle Manufacturer: Floplast Colour: Mahogany Woodgrain Effect Finish Woodgrain Rainwater Sytems come with a 10year manufacturers Performance and Colour Guarantee. Authentic Mahogany Look. Ideally suited for conservatories.. Description: 135 Degree Mahogany Square Gutter Angle Manufacturer: Floplast Colour: Mahogany Woodgrain Effect Finish Woodgrain Rainwater Sytems come with a 10year manufacturers Performance and Colour Guarantee. Authentic Mahogany Look. Ideally suited for conserva.. Description: Mahogany Square External Gutter Stop End Manufacturer: Floplast Colour: Mahogany Woodgrain Effect Finish Woodgrain Rainwater Sytems come with a 10year manufacturers Performance and Colour Guarantee. Authentic Mahogany Look. Ideally suited for conservatori.. Description: Mahogany Square Internal Gutter Stop End Manufacturer: Floplast Colour: Mahogany Woodgrain Effect Finish Woodgrain Rainwater Sytems come with a 10year manufacturers Performance and Colour Guarantee. Authentic Mahogany Look. Ideally suited for conserv.. Description: Mahogany Square Gutter Fascia Bracket Manufacturer: Floplast Colour: Mahogany Woodgrain Effect Finish Woodgrain Rainwater Sytems come with a 10year manufacturers Performance and Colour Guarantee. Authentic Mahogany Look. Ideally suited for conservatories.. Description: Mahogany Square Gutter Running Outlet - 65mm Square Manufacturer: Floplast Colour: Mahogany Woodgrain Effect Finish Woodgrain Rainwater Sytems come with a 10year manufacturers Performance and Colour Guarantee. Authentic Mahogany Look. Ideally suited for c.. Description: Mahogany Square Gutter Union Bracket Manufacturer: Floplast Colour: Mahogany Woodgrain Effect Finish Woodgrain Rainwater Sytems come with a 10year manufacturers Performance and Colour Guarantee. Authentic Mahogany Look. Ideally suited for conservatories, .. Description: 2.5m Mahogany Square Gutter Downpipe Manufacturer: Floplast Colour: Mahogany Woodgrain Effect Finish Woodgrain Rainwater Sytems come with a 10year manufacturers Performance and Colour Guarantee. Authentic Mahogany Look. Ideally suited for conservatories, bunga.. Description: Mahogany Gutter Hopper Manufacturer: Floplast Colour: Mahogany Woodgrain Effect Finish Woodgrain Rainwater Sytems come with a 10year manufacturers Performance and Colour Guarantee. Authentic Mahogany Look. Ideally suited for conservatories, bungalows or any in.. 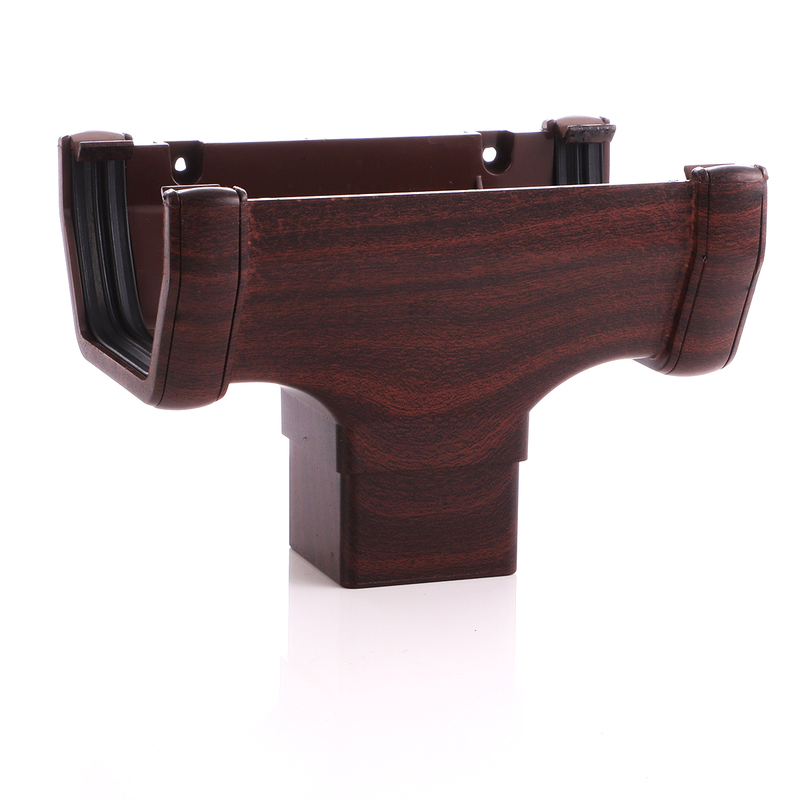 Description: Mahogany Gutter Downpipe Clip Manufacturer: Floplast Colour: Mahogany Woodgrain Effect Finish Woodgrain Rainwater Sytems come with a 10year manufacturers Performance and Colour Guarantee. Authentic Mahogany Look. Ideally suited for conservatories, bungalows or.. Description: Mahogany Gutter Downpipe Socket Manufacturer: Floplast Colour: Mahogany Woodgrain Effect Finish Woodgrain Rainwater Sytems come with a 10year manufacturers Performance and Colour Guarantee. Authentic Mahogany Look. Ideally suited for conservatories, bungalows .. Description: Mahogany Downpipe 112 Offset Bend Manufacturer: Floplast Colour: Mahogany Woodgrain Effect Finish Woodgrain Rainwater Sytems come with a 10year manufacturers Performance and Colour Guarantee. Authentic Mahogany Look. Ideally suited for conservatories, bungalow.. Description: Mahogany Downpipe 92.5 Offset Bend Manufacturer: Floplast Colour: Mahogany Woodgrain Effect Finish Woodgrain Rainwater Sytems come with a 10year manufacturers Performance and Colour Guarantee. Authentic Mahogany Look. Ideally suited for conservatories, bungalo.. Description: Mahogany Downpipe Shoe Manufacturer: Floplast Colour: Mahogany Woodgrain Effect Finish Woodgrain Rainwater Sytems come with a 10year manufacturers Performance and Colour Guarantee. Authentic Mahogany Look. Ideally suited for conservatories, bungalows or any in.. Description: Mahogany Downpipe Branch Manufacturer: Floplast Colour: Mahogany Woodgrain Effect Finish Woodgrain Rainwater Sytems come with a 10year manufacturers Performance and Colour Guarantee. Authentic Mahogany Look. Ideally suited for conservatories, bungalows or any ..